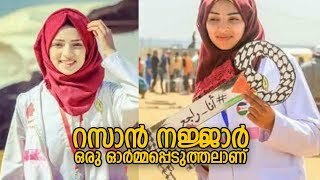 Witnesses say Israeli soldiers shot dead 21-year-old Palestinian medic Razan al-Najjar as she ran toward the border fence to provide medical aid to a wounded protester. Since nonviolent protests began at the end of March, Israeli soldiers have killed at least 119 people, including 14 children. More than 13,000 have been wounded. “It was clear to everybody that she was a paramedic, that that was murder. I mean, that was a crime committed before cameras,” said Dr. Medhat Abbas, director of Al-Shifa Hospital, the largest medical facility in the Gaza Strip.